Submit a request for a quote and receive an Ancient Roman Coin (at least 1,500 years old) as a token of our appreciation. Aqua Survey supports archaeology, adventure and the exploration of history. That’s why we’d like to share a small piece of it with you. No need to do anything special. Request a quote for our services between 2/11/19 and 3/31/19 and we’ll send you an Ancient Roman coin. Mysterious Rocks – Secret Glyph, a Privateer’s Pride or Heavy Lawn Ornament? Has time forgotten the meaning behind these rocks? Do you have a theory? Last week on an archeological project in Jamestown, RI we encountered a mysterious stone arrangement. Organized in a cross formation, they aligned perfectly with the four cardinal compass directions. We were on the Cajacet homestead, built in 1690 by famous Privateer Thomas Paine. More infamous than famous in his day, Paine skirted the line between pirate and privateer and rubbed shoulders with questionable characters like Captain Kidd. Ultimately achieving legitimacy and high status in New England colonial society, Paine left his outlaw tendencies behind. In 1690, his naval experience proved of instrumental value when he led a small fleet in open water combat against French ships attempting to raid Block Island, forcing the would-be invaders to retreat. Various stories surround the rocks. Some claim they were put there by Thomas Paine himself. Others believe they were put there long before and held significance to an American Indian tribe. Some even speculate that Norsemen laid them long before the Dutch settled the area. Whether it was the Native Americans, Norseman, Dutch or Paine himself, did they hold a hidden meaning or were they simply a source of pride for a man who amassed his wealth navigating the high seas? If you have an insight or theory behind the origin of this “compass”, we’d love hear from you. Rivalries have been part of the world’s history: who gets water and how water gets shared has always been a big deal. Alison M. Jones of No Water No Life recently reminded us where the word rivalry comes from. It is such a key word when governments, citizens and industries square off. Most elementary school kids had rivals at the water fountain right after recess on a hot spring day; competing for water rights. When there is a drought, sprinkler people, pool people and car washers square off with local ordinances. Ordinances are not always easy to follow (e.g., you can wash your car on even numbered days… provided the number of the day before ended in a vowel, the moon was full and your last name started with a consonant). We are a niche provider of rather unique, waterborne services. Providing hard scientific data, our services often help resolve rivalries. Mostly, we pinpoint and characterize things that have gone missing: UXO (bombs), contaminants, murder weapons and treasure. It’s fascinating work. We are good at it. We enjoy offering these services worldwide. Governor Christie Whitman and 23 environmental professionals were presented Blue Peter Awards in recognition of their remarkable leadership skills earlier this month at a special gala in Princeton, NJ. Whitman’s acceptance comments encouraged fellow awardees and all attendees to be exceptional leaders in this time of change. Master of ceremonies, news anchor Karen Lee, greeted guests on the red carpet and presided over the awards ceremony. A nautical symbol, the Blue Peter signifies the ship’s crew is outward bound. The crew will ultimately share a common fate, therefore is of extreme importance to function as a team. The projects we tackle together as an industry are complex, often involving many firms, organizations and disciplines. Just like a ship’s crew, we are in this together. This was the fourth Blue Peter Awards event. 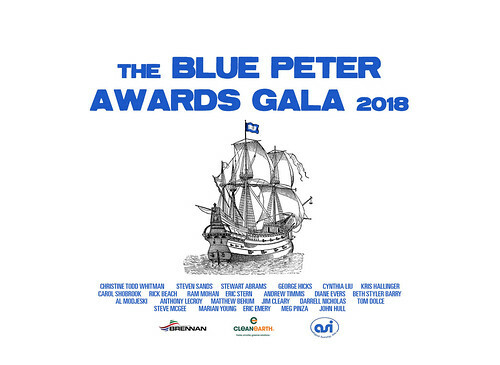 Ken Hayes, Aqua Survey’s president, founded the Blue Peter Awards to pay tribute to excellence in environmental leadership; honoring individuals with management skills that help projects to run more safely, timely, effectively and professionally. For a full list of Blue Peter recipients, Click Here. Congratulations to the 2018 Blue Peter Award Recipients! Steven Sands – Clean Earth, Inc.
George Hicks – Tetra Tech, Inc.
Cynthia Liu – Engineering/Remediation Resources Group, Inc.
Kris Hallinger – ERM Group, Inc.
Rick Beach – GZA Environmental, Inc.
Ram Mohan – Anchor QEA, LLC. Eric Stern – Tipping Point Resource Group, LLC. Andrew Timmis – J.F. Brennan, Inc.
Anthony LeCroy – SNF Environmental, Inc.
Tom Dolce – Aqua Survey, Inc.
Steve McGee – Tetra Tech, Inc.
Marian Young – Brightfields, Inc.
Meg Pinza – EcoAnalysts, Inc.
John Hull – Hull & Associates, Inc.
What is a Blue Peter? A nautical symbol, the Blue Peter flag signifies the ship’s crew is outward bound. The crew will ultimately share a common fate, therefore it is of extreme importance to function as a team.